The terms jigsaw and sabre saw seem to be used interchangeably in the marketplace. And while different tool manufacturers have marketed their saws under both names, there's no recognized difference between a jigsaw and a sabre saw. They're the same tool. A quick look at the history of this handy portable saw reveals why there were two names, to begin with. 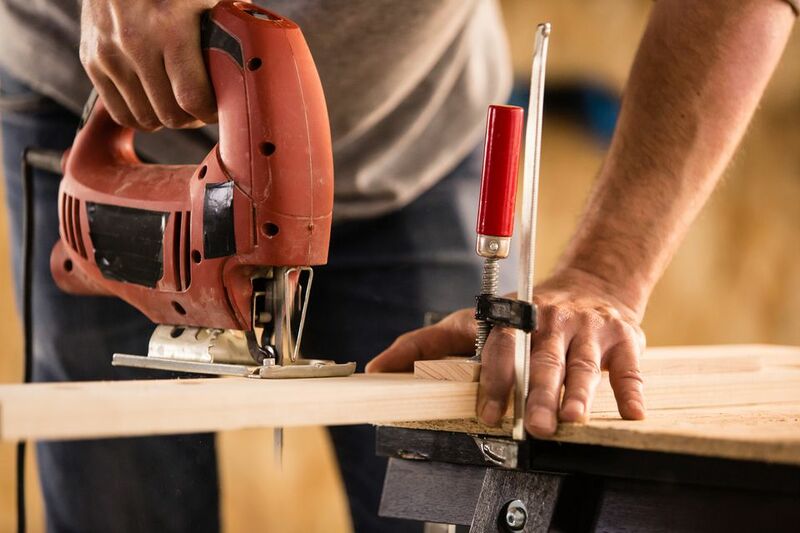 The portable power tool we now know as a jigsaw—or a sabre saw—evolved from the small stationary power saw known as a scroll saw. A traditional scroll saw is a tabletop tool that has a reciprocating blade that is secured at both ends and moves up and down. Early variations on the scroll saw had blades that were fixed on one side only. This variation was referred to as a jig saw. The stationary jig saw (with a blade open on one end) evolved into a portable, handheld tool. It became very popular, and some manufacturers soon placed a knob on top of the unit that could be used to turn the reciprocating blade for use in intricate cutting tasks. As these tools continued to evolve, those with the blade-turning knob were often referred to as jig saws, while those without the knob were commonly called sabre saws. Therefore, the difference was merely an industry convention for distinguishing between two different types of handheld versions of the tabletop jig saw. If the original terminology wasn't confusing enough, the term sabre saw was also sometimes used for the reciprocating saw. These saws are available from a number of manufacturers and are sometimes commonly referred to as a "Sawzall"—the trademarked name for this type of saw that is manufactured by the Milwaukee Electric Tool Company. A reciprocating saw is most often used in demolition and construction and sees little use for fine woodworking. Fortunately, this labeling confusion has largely disappeared, and the term reciprocating saw is now the standard name for this type of demolition saw. Today, we have lost most of the early distinctions between handheld sabre saws and handheld jig saws. Any type of handheld saw with a short reciprocating blade attached on one side only can be called either a sabre saw or jig saw—the choice of names is really up to the manufacturer. However, most saws of this description now on the market are called jigsaws. The evolution to one word probably stems from the natural formation of compound words, or two words becoming one. A jigsaw sold today may or may not include the rotating handle on top of the tool. Meanwhile, the naming of tabletop versions of these tools also has simplified; they are now universally known as scroll saws. And whether you call them jigsaws, jig saws, saber saws, or even saber saws (a variant spelling), they're all children of the scroll saw and do pretty much the same thing: make nice curved cuts in wood (as well as plastic, metal, and almost any other material).